Prospect Capital Corp. is an attractive high-yield income vehicle for dividend investors with an above-average risk tolerance. Prospect Capital Corp. has decent portfolio quality and a low amount of non-accruals. Shares are ripe for a move higher, and still sell for a large 27 percent discount to net asset value. Risk/reward at today's price point is moderately attractive. I can see up to 10 percent upside potential in 2019 if dividend coverage doesn't deteriorate. An investment in PSEC yields 10.9 percent. 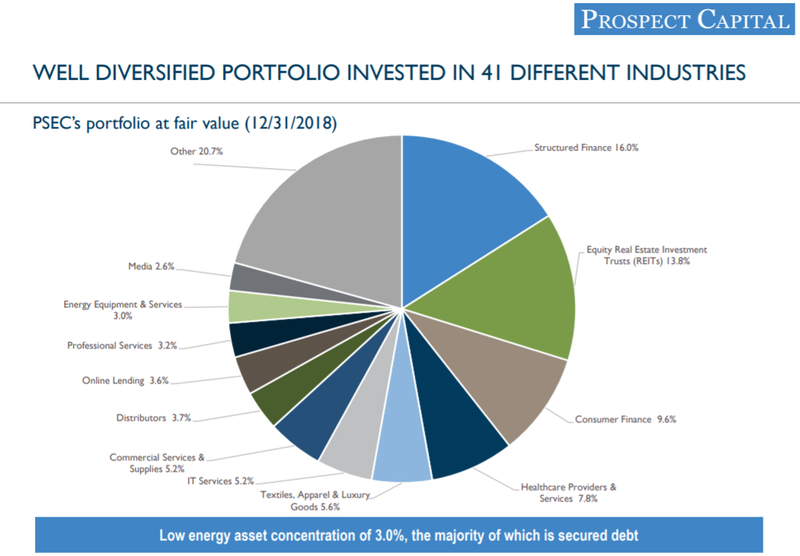 Prospect Capital Corp. (PSEC) is an attractive, yet controversial business development company to consider for investors that have an above-average risk tolerance and that like to capture high, recurring monthly dividend income. Prospect Capital Corp. has good credit quality and covers its dividend with net investment income in each of the last five quarters. 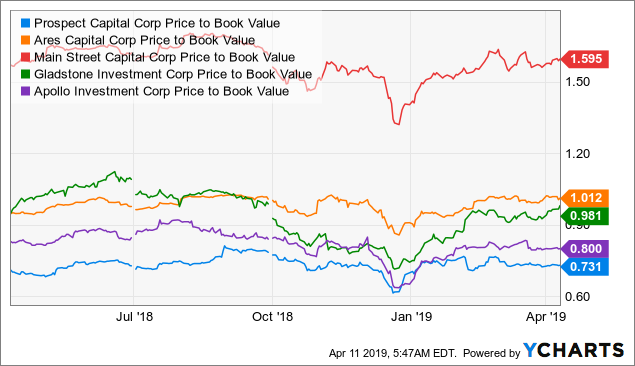 The BDC's shares are currently priced at a 27 percent discount to net asset value, and I see ~10 percent upside in 2019 if the company maintains good distribution coverage in 2019. An investment in PSEC yields 10.9 percent. Prospect Capital Corp. is structured as a business development company meaning it must pay out the majority of its earnings/taxable income as dividends to the shareholders of the company. Prospect Capital Corp. provides private debt and equity capital to U.S. middle market companies whose EBITDAs typically range between $5 and $150 million. 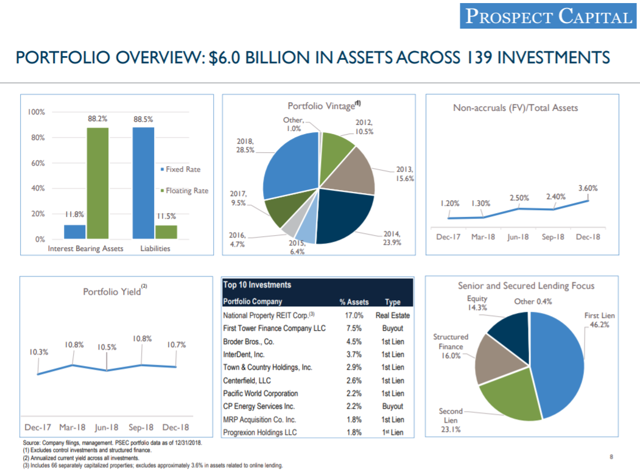 Prospect Capital Corp.'s investment portfolio was valued at ~$6.0 billion at the end of the December quarter and included 139 different investments across multiple industries. About half of the company's investments (46.2 percent) are relatively secure first liens and 23.1 percent are second liens. Prospect Capital Corp. further has exposure to structured finance products and equity. Prospect Capital Corp. is moderately diversified in terms of industries. Importantly, the business development company only has 3.0 percent of its investments in the volatile energy industry which reduces downside risks for investors. Prospect Capital Corp. has good, though not great portfolio quality. The BDC's non-accrual ratio (as a percent of total assets) sat at 3.6 percent at the end of the December quarter. Non-accruals are non-performing loans where the payment of interest and the repayment of the principal are at risk. Here's Prospect Capital Corp.'s non-accrual trend over the last six quarters. 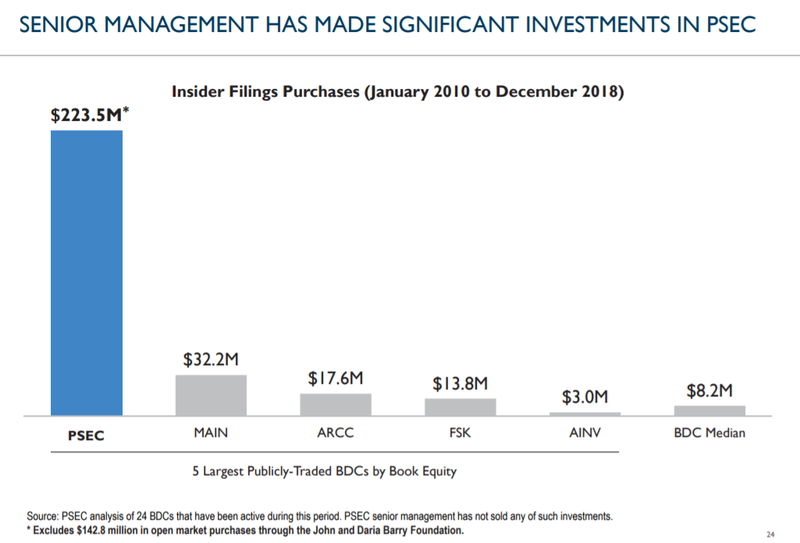 Prospect Capital Corp.'s senior management team owns a considerable chunk of the business development company's equity: Management has invested more than $200 million in PSEC which is by far the most of any business development company in the sector. Prospect Capital Corp. produces about $70-$80 million quarterly in run-rate net investment income and has reported a net increase in net assets related to operations in four out of the last five quarters. Prospect Capital Corp. regularly recycles capital into new investments that produces recurring interest income. Here's a snapshot of the BDC's financial performance over the last five quarters. Prospect Capital Corp.'s actual financial performance - as measured by its return on equity - has not been that bad at all: In the last five years, Prospect Capital Corp.'s average annual ROE exceeded the ROEs of competing BDC firms in the sector by a meaningful margin. Prospect Capital Corp. has outearned its dividend with net investment income in each of the last five quarters. The BDC pulled in an average of $0.21/share in NII in the last five quarters compared to a cumulative quarterly dividend payout of $0.18/share (Prospect Capital Corp. pays its dividend on a monthly basis). Here are Prospect Capital Corp.'s major distribution coverage stats (quarters depict calendar quarters). Prospect Capital Corp.'s dividend coverage stats improved considerably after the company cut its monthly dividend payout from $0.08333/share to $0.06/share in October 2017. 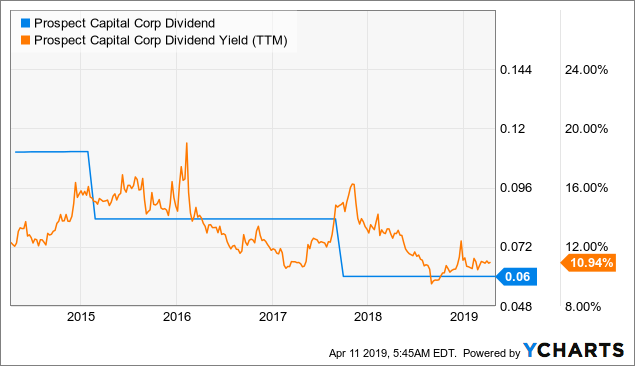 The BDC cut its dividend twice since 2015, both times by major percentages, which triggered a major widening in Prospect Capital Corp.'s NAV discount each time. 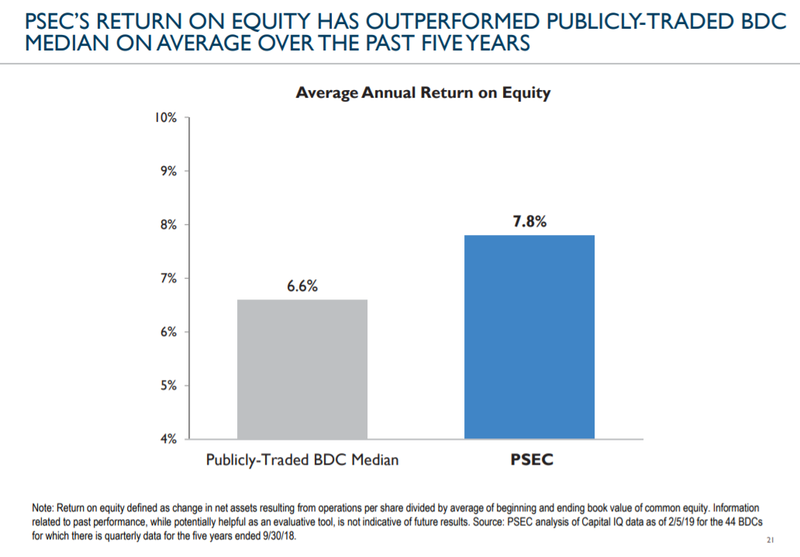 Here's PSEC's five-year dividend growth chart. Prospect Capital Corp.'s dividend stream currently costs income investors ~7.5x Q4-2018 run-rate net investment income which is a sensible NII multiple. Prospect Capital Corp. is still the cheapest BDC in the sector in terms of P/NAV-ratio, largely because of the BDC's more unreliable dividend history. Today, Prospect Capital Corp.'s shares are priced at a 27 percent discount to net asset value. If Prospect Capital Corp.'s Q3-2019 results are decent, meaning the BDC once again covers its dividend with NII and reports stable net investment income and a stable net asset value on a per-share basis, I project that the net asset value discount will narrow going forward. I can see up to 10 percent upside for Prospect Capital Corp. in 2019 as long as the company outearns its dividend with NII and the degree of excess coverage doesn't deteriorate throughout the year. 10 percent upside from today's price level suggests a target price of $7.24 which in turn would still imply a 20 percent discount to NAV (assuming a stable NAV of $9.02/share). A U.S. recession could trigger an increase in corporate bankruptcies and non-performing loans. An increase in troubled loans (non-accruals) could put pressure on Prospect Capital Corp.'s net investment income and distribution. In case the BDC cuts its dividend again, shareholders have considerable valuation downside. Prospect Capital Corp. is a promising business development company for investors that have an above-average risk tolerance and that are comfortable with the company's past dividend cuts. Prospect Capital Corp.'s portfolio quality remained solid in the last quarter, and the BDC continued to cover its cumulative dividend payout with net investment income. A dividend cut, at this point, is very unlikely, in my opinion. Investors also get to benefit from a 27 percent discount to the last reported net asset value, which improves the value proposition. If PSEC manages to defend its NAV in 2019 and its net investment income doesn't deteriorate, the BDC's shares could surprise to the upside. Buy for income and capital appreciation. Disclosure: I am/we are long PSEC, MAIN. I wrote this article myself, and it expresses my own opinions. I am not receiving compensation for it (other than from Seeking Alpha). I have no business relationship with any company whose stock is mentioned in this article.